Parks Outdoor Maintenance in Monrovia has been built on faith, family and diversification. 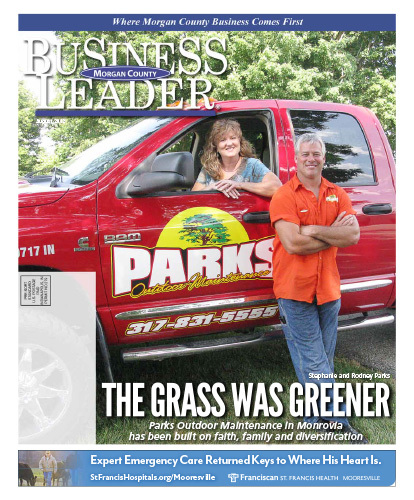 With a surname of Parks, it would seem that lawn care and outdoor maintenance would be a given occupation. It wasn’t quite that simple for Rodney Parks, but it was definitely what was meant to be. Rodney Parks went to ITT Technical Institute and subsequently got a job in robotics at Eli Lilly. After a few years, his wife, Stephanie, became pregnant with their first child. They really wanted her to be able to stay at home with the new baby, so Rodney started doing what he did as a teen to raise extra money – he started mowing lawns on the side. Over five years, as the side job grew, so did his family responsibilities with another child and a new house. The couple realized something had to go. Despite the security of the 9-5 job, a drought across the state and all the responsibility at home, it was the job at Lilly that went. Friends and peers thought he was crazy, Stephanie was behind him and they felt the Lord was leading them in a different direction – a path out on their own. customers about different services like lawn fertilizing, irrigation system installation and repair, landscape design and installation, even bush hogging empty lots. He hired part-time workers who eventually became full-time employees. Download the full August 2012 Edition here.